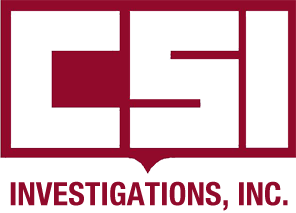 CSI Investigations, Inc., is a full service private investigative company that is dedicated to providing you with the finest service and value in the industry. We work with lawyers, corporations, and private individuals to uncover the truth. Call (318) 869-2222 or fill out our form today to discuss your situation with a member of our staff. Retired police officer with over 35 years of continuous, full-time investigative experience. Investigators thoroughly trained in all aspects of covert video surveillance, court testimony, and report writing. CSI Investigators work closely with insurance defense attorneys and businesses to provide court-ready evidence in insurance claim cases. Services include, but are not limited to, video surveillance, background checks, witness location and interviews, and service of due process. We will give you the evidence you need to make a sound business decision. We provide a thorough background investigation consisting of information about an individual's past and current behavior. These investigations may include civil and/or criminal proceedings, obtaining court documents, past residence, driving records, professional licensing verification, property records, and other database investigations. Our investigators are experienced and equipped to conduct child custody investigations. We work diligently with individuals and their attorneys to ensure the welfare and safety of the child. The evidence we skillfully document will be provided with a copy of any video footage and a comprehensive and professional report. CSI Investigators handle child custody assignments with the upmost discretion and performance to give you the peace of mind you need. We work closely with attorneys and other clients to provide necessary evidence to defend criminal charges. Our criminal investigations are done on a case-by-case basis, specifically tailored to individual needs. Services may include crime scene investigation, witness location, interviews, recorded statements, photographs, subpoena service, in-depth background check, and other requested services. Our experienced investigators gather infidelity and child custody evidence by documenting activities using covert video surveillance. On a case-by-case basis, our investigators will conduct infidelity surveillance, background checks, asset searches, child custody surveillance, and more. We want you to have the evidence you need to make a rational decision. All investigations are conducted with the upmost discretion. CSI Investigators are thoroughly trained in accident scene investigations. Our investigators gather and document critical information and evidence through accident scene photographs, measurements, diagrams, police reports, and driver and witness statements/interviews. Services provided to businesses experiencing loss prevention problems including workplace theft. Our investigators are thoroughly trained to go undercover including covert video surveillance, assessing workplace security, employee access to valuables, and interviewing managers/employees about illegal actions. Issues could also include time theft, drug abuse or sales, sexual harassment, safety issues, drinking on the job, or a hostile work environment. We provide nanny surveillance in three ways: mobile, stationary, or by using tiny, hidden cameras. Whether by watching your nanny transport your child, interact with him/her in public, or capture video of home activities, we can give you peace of mind about anyone watching or interacting with your child. Skip tracing is the process of locating a person for collections, process service, witness locations, family/friend location, and more. Using specialists and databases, we gather, analyze, reduce, and verify important information. Using this process, we can quickly and cost effectively locate the friend, witness, or defendant you are looking for. Do you need a private investigator, skip tracing, or surveillance services? © Copyright CSI Investigations Inc.. All rights reserved.